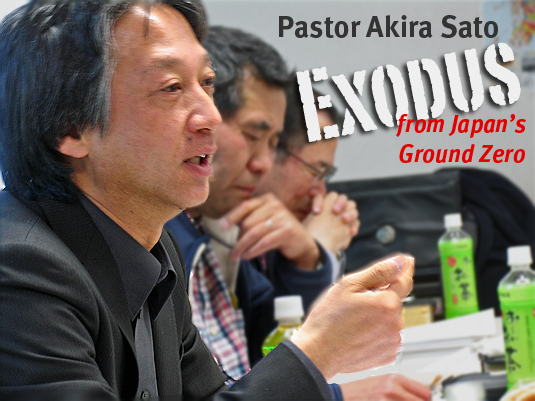 Pastor Sato heads to the U.S. to personally share about Fukushima First Bible Baptist Church's experience following the nuclear disaster in Japan! C.L. Hunter, CEO of "Christ Hu Nterz Productions" (pronounced "Christ Who Enters") recently approached Asian Access to partner with him in promoting a great new song by Fahren Johnson, "He Reigns Over All the Earth." God has burned in my heart the 86 communities washed away! In a time of chaos, it's a kairos moment. the formless matter supposedly present before the creation of the universe. a propitious moment for decision or action; (Greek), literally "opportunity"
I’m borrowing the name of a fellow A2 missionary Dorrie Takazawa’s blog, "Chaos and Kairos” because these words accurately sum up this overwhelming situation in Japan. Looking at the news reports, you can see the chaos everywhere. Though the Japanese government has meticulously planned for and methodically prepared for how to deal with natural disasters like earthquakes and tsunamis, this double whammy is of the scope that it has always feared. The most powerful quake in Japan’s history has brought a devastating tsunami (tidal wave). Villages gone. Ships on land and homes on the sea. A nuclear power plant explosion; fires, people stranded and hundreds (probably thousands) of dead and missing. Aftershocks keep coming to remind us that it may not even be over yet. With rescue and recovery still underway, rebuilding infrastructure and, more importantly, lives must wait. Yet, it is my firm belief that we are observing a kairos moment in history—the history of Japan and the history of Christ’s Church in Japan. It's a God-moment . . . a time of decision, of action, of opportunity. Twenty four years later, the quake was finally birthed—late and large. . . and brought an even deadlier twin after it. We are standing at an historical kairos moment. This is a time that did not take God by surprise, and a time to which many in Japan have pointed. With suicide at an all-time high, the economy at a depressing low, family breakdowns commonplace, and the moral compass directionless, Japanese people seem to be without hope. It’s quite obvious to us living here. Our missionaries have seen this in the society as a whole, and in individual’s lives. But could this be a kairos moment? Could this time of disaster be anunparalleled opportunity? An opportunity for God to bring in a harvest? An opportunity for Japanese to forget their pursuit of affluence to finally and honestly contemplate the deeper meaning of life? Could it be an opportunity for a great display of Christ’s love through his Bride, the Church in Japan? I believe so. This is indeed kairos moment. . . a propitious time of decision and action. Will the Church in other places rally to help deliver hope and practical help to the Japanese and do so through the Japanese Church? We certainly hope so. If you’re looking for a way to help as you watch the chaos play out on your screens, pray that the Church would seize this kairos moment to show the love of Christ. Pray that people would be helped and loved in real ways. Asian Access has set up the the Japan Tsunami Relief Fund (http://asianaccess.org). Gifts will be channeled through various networks of partner churches. Our own missionaries plan to be involved in actual work, as well. Not at Urbana '09, but still sending short termers!